A method of printing designs (using ceramic inks) onto a transparent film, then transferring that to glazed ware. The film has a glue that holds it to a heavy opaque paper backing coated with a glossy release layer. On wetting (for the correct amount of time), the glue loosens and enables the transfer. As the decal dries on the ware the glue holds it in place. When fired, the very think film backing material burns away leaving the ink to bond with the glaze surface. The film can accommodate quite a bit of irregularity in the contours of the surface. The inks used in decals melt at a much lower temperature than typical glazes, around cone 022. Decals can be printed directly in an inkjet printer (fitted with ceramic ink cartridges) or by silk screening (the latter transitioning to the former in recent years). The new technology has many obvious advantages. In fact manufacturers of ink formulations, mediums, silk screening, and ceramic waterslide decals have gone out of business in recent years and this has caused problems with companies who depend on them. Their formulations were lost in the process notwithstanding that silk screen decal process is still very useful. Are you an engineer who knows about these formulations. Would you be able to help to make these directly available to manufacturers? Please contact us. The ink is a specialized formulation of nano-powdered frit (bismuth based) and stains, it forms a glassy color at very low temperatures. Very bright colors are possible. However, since the designs are on the glaze surface, they must endure the full forces of wear and tear to which the piece is exposed. Since these inks do not contain the stable silicates that a glaze does (because they need to melt so low), they are more subject to abrasion and degradation. However, there is a trade-off. Because the decal firing only goes to around 1600F very bright colors are possible and the underlying glaze usually does not melt enough to bleed their edges. This stable surface enables great precision of design, full color photos can thus be produced having a quality that rivals regular print. Firing decals on large pieces can put you on a collision course with ware cracking resulting from stresses in passing up or down too fast through quartz or cristobalite inversions. It is a necessity to have a programable kiln controller to slow down through these periods. There is a serious issue to think about if you are planning to introduce decals into your production: Many glazes are reactive fluid melters (high boron, zinc, lithium) and begin to soften at decal temperatures. These will often form pits, pinholes or even blisters during the firing on of the decal, ruining the piece. The higher you fire and the later the glaze melts the more you will avoid this serious problem. 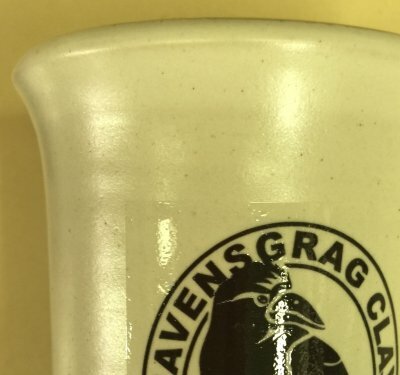 Even if it does not melt, the glaze may have a visual character (color or surface texture) that is a product of crystallization during cooling, these crystals could easy be affected during a decal firing. Please visit http://ceramicdecals.org for much more information. What is that glossy square around the decal? An example of a digital decal that has been fired at 1500F onto a matte cone 6 glaze. Notice the glossy, square around the graphic. This is where the decal paper was cut prior to transfer. This glossy layer appears by design, the decal paper has a thin layer of glaze and your inkjet design is printed, reverse reading, onto that. After transfer and firing that glaze thus insulates the color from coming into contact with anything that might leach it. It is thus wise to trim carefully around designs such that the glossy pattern does not detract from the appearance (as it does here). You can get decals without the glaze covering, but may not melt enough to be durable on the glaze surface. 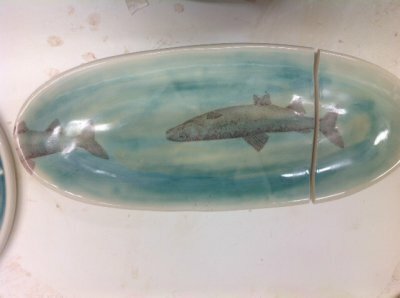 Why did this piece came out of a decal firing crazed? 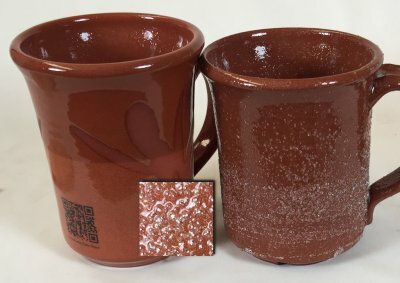 This Cone 10 matte mug has been refired to attach decals. During the refire the Quartz-containing body passed up through quartz and cristobalite inversions while the glaze did not (all of its quartz was converted to silicates during the previous glaze firing). The sudden expansion in these two zones stretched the glaze and cracked it. Had that glaze been better fitted (under some compression) it would have been able to survive. Why has this platter has cracked in half during a decal firing? Your ware is fairly thick. It was already vitrified in a previous firing. It now must climb and fall through quartz and cristobalite inversions during a decal firing. The firing schedule provided by the decal supplier ramps up very quickly. The result? A cracked piece. 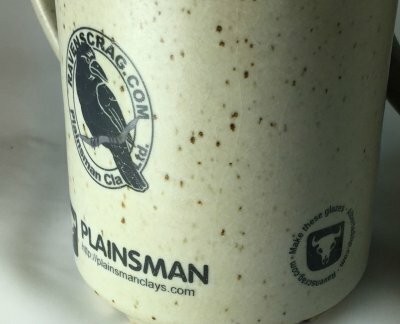 Can a decal firing melt a glaze? Yes! Typical zero-boron high temperature glazes will not soften in a 1500F decal firing. But low temperature glazes will (especially those high in boron). Even middle temperature ones can soften. G3806C, for example, is reactive and fluid, it certainly will. Even G2926B, which has high Al2O3 and SiO2, has enough boron to soften and sometimes create tiny pits. In serious cases they can bubble like the mug on the right. Why? Steam. It was in use and had been absorbing water in the months since it was first glaze fired at cone 03. The one on the left was not used, but it did have some time to absorb water from the air, it is showing tiny pits in the surface. Even if moisture is not present, low fire bodies especially may still have some gases of decomposition to affect the glaze. One more thing: Fire the decals at the recommended temperature, often cone 022. Inkjet equipment and inks are now big business in ceramics, a renaissance in decoration. At this time this page is just a jumping point to others.